This is the guided reading template I use for my reading groups during Daily 5 rounds. It covers the entire week and is flexible and adaptable for grade levels, strategies, and reading levels. I hope this helps you plan in a quick and efficient manner! Happy Planning! 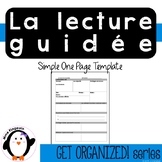 This pack includes 6 planning templates (one weekly and five daily), word work ideas, and a cueing/strategy stems page. 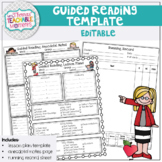 This template allows you to plan for effective Guided Reading instruction for Transitional and Fluent Readers that is strategy-based. It helps you focus your observation of readers through the lenses of Comprehension, Decoding, and Fluency. These guided reading templates will help your students effectively summarize and reflect upon the stories they read in Spanish. Includes two templates, each 2-pages long. These can be used at any grade level with any story, including current events. This is an excellent template to use with your Guided Reading Groups. Instead of giving students busy work, have them work through a very targeted packet that is designed to hit the Common Core Standards. If wanted, I am happy to send a digital copy for you to use with Google Classroom. This is a template you can use for lesson planning for guided reading time. It's very easy to follow and great for substitutes! Just print the form and fill it in! This is an editable guided reading template. It is aligned to 4th grade common core fiction and nonfiction standards but can be changed. Word document that can be edited. It is a place to record observations, next steps for guided reading. The Mini Greg Guided Reading Template.